Looking for accommodation in Naxos? Check out Luxury Holiday Villas in Naxos! 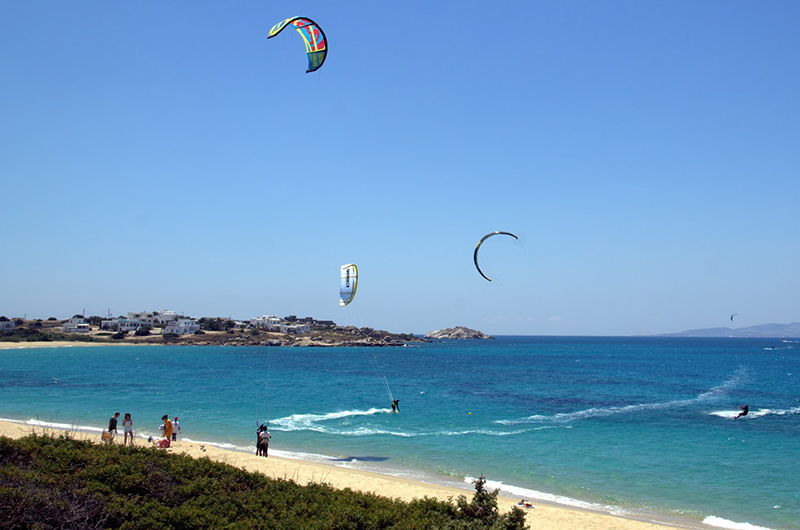 Agios Prokopios is the most famous beach of Naxos. It is just 5 km from the town. It has been voted by international tourism magazines as one of the best beaches in Greece and Europe. The golden sand covers about 2 km. Here, visitors can indulge in water sports and games. Around the beach are offered high quality tourism services. 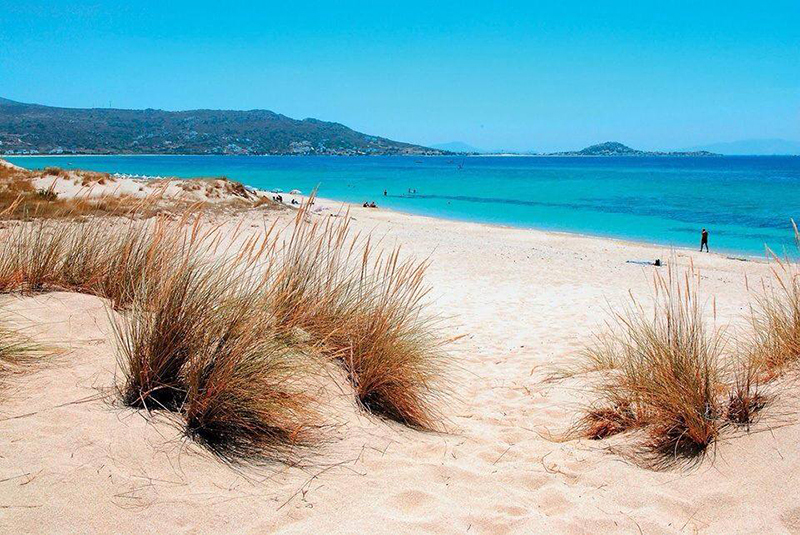 The beach of Agia Anna is considered one of the most famous beaches of Naxos. 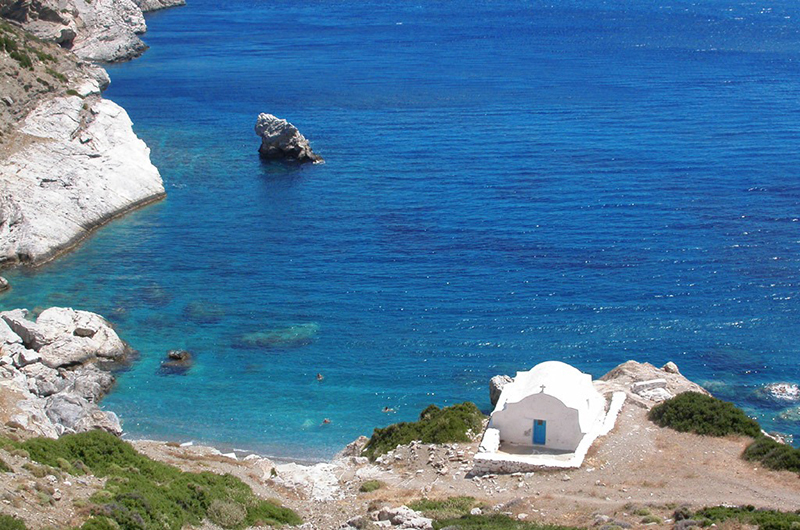 It is approximately 6.7 km from the town of Naxos. It is the next beach after Agios Prokopios. The fine golden sand attracts families looking for the perfect place to enjoy their swim. It is an organized beach with sunbeds and umbrellas, restaurants and beach bar. 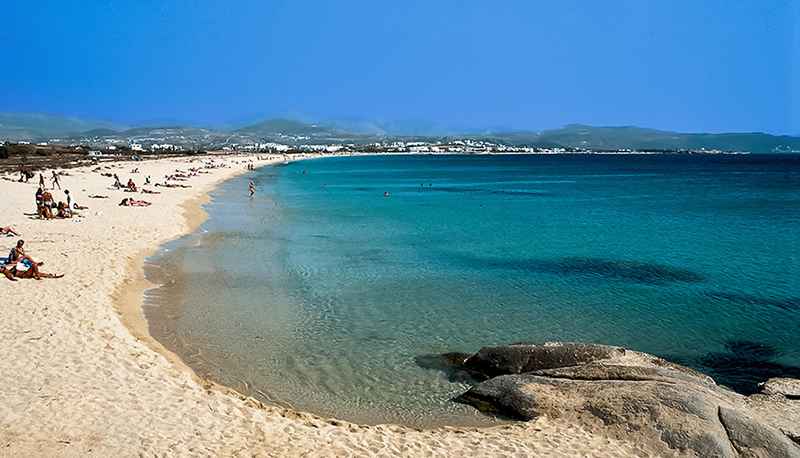 The beach of Plaka is one of the largest beaches in Naxos located within 8 km. from Naxos town.It is the continuing part of Agia Anna and Marangas beaches. Its largest part is organized with sunbeds and umbrellas and guests can enjoy water sports. Its fine, white sand forms dunes where children love to play. Aliko is a sheltered sandy beach with one of the most beautiful cedar forests that exist in Greece. The beautiful trees offer shade to the swimmers. The visit to Aliko combines tranquility and isolation, while the visitor has the opportunity to relax in rented sun beds located on the beach. It is also worth walking to the white church with the blue dome, built over the rocks, to photograph the panoramic landscape. The name of the beach means the observatory from which locals supervised the sea because of the danger of pirates invasion. Surfers love this beach. It is located in the western part of the island and is 16 km from the town of Naxos. The beach is divided in two smaller beaches by a rock. One is called Parthena and is most preferred by lovers of windsurfing. 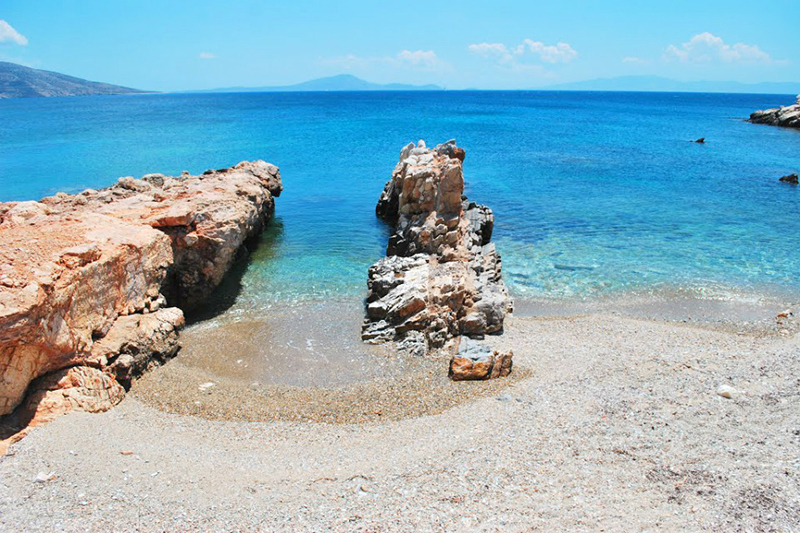 The other one, Mikri Vigla, is mainly preferred by families because of its calm waters. Both of them are sandy, with blue waters. The famous Apiranthos village is located 32 km. northwest of the town of the island. You will be impressed by the traditional architecture of its stone houses, the well-preserved churches and museums: the small Archaeological Museum, the Natural History Museum, the Folk Museum and the Fine Arts Museum. 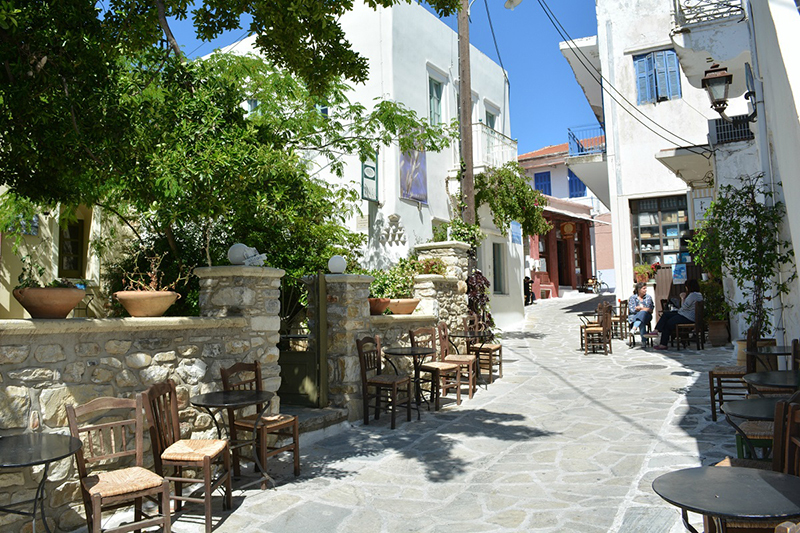 You can visit the village on car or motorbike, by following the route: Naxos town – Galanado – Sagkri- Chalki- Filoti- Apiranthos. Apiranthos is also connected with the town with bus service. 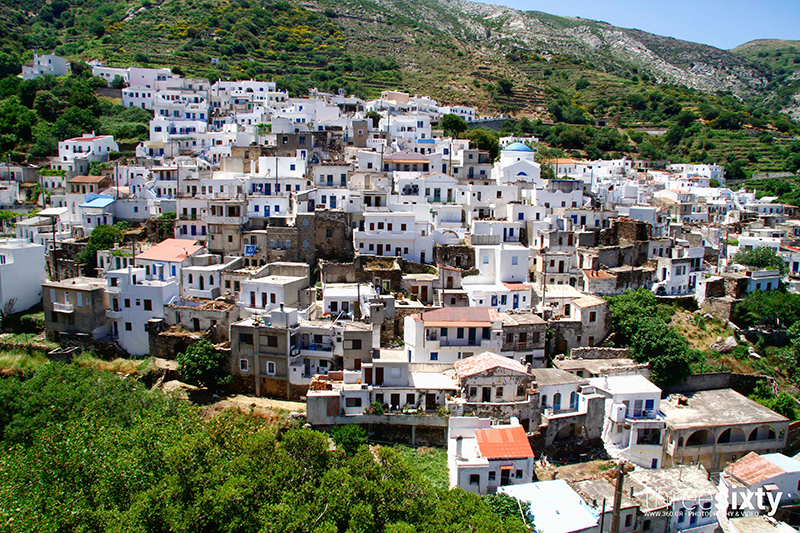 Filoti village is located 18.3 km east of Naxos Town. It is the largest village on the island. It has a rich history, many important monuments and the surrounding area is ideal for those who love hiking, as there are many hiking trails. The village is popular for its lambs and cheese. In the square of the village with the old plane trees, you will find cafes and restaurants, banks, post office and police station. Apollonas village is a peaceful area, 54 km. northeast of the town, which you should definitely visit during Naxos holidays. 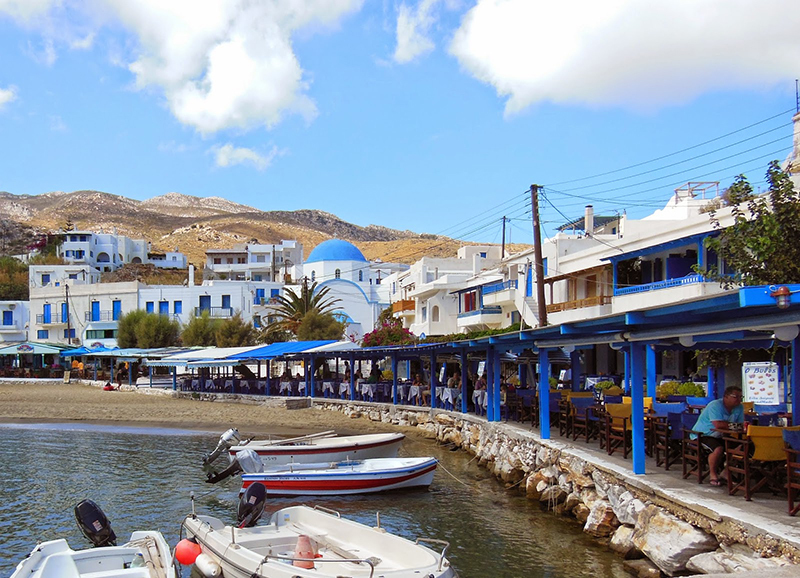 The picturesque harbor, the Statue of Kouros and the beach of the village are the landmarks of the region. In Apollonas, you will also see a prehistoric tower with Cyclopean walls, the ancient harbor, marble pavements and prehistoric castles. Chalki village located 15 km. east of Naxos town. The mansions, the imposing towers and Byzantine churches, prove that once the village had some glorious moments. In Chalki the visitors can admire the towers of Barozzi and Markopolitis, the Temple of Virgin Mary, erected in the 6th century AD, the neoclassical buildings and chapels “hidden” in the orchards and olive groves. Chalki was many years ago the island’s capital. Koronos, located 30 km northeast of Naxos, has been characterized by the National Geographic as one of the prettiest villages in Cyclades. Its white houses, history, flavors and residents with their linguistic idiom have made it one of the most popular destinations of Naxos holidays. 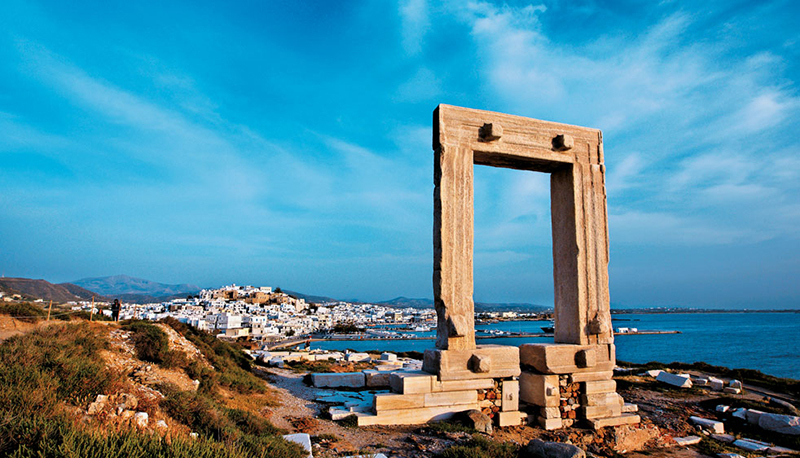 The island of Palaces and Portara are undoubtedly the representative monuments of Naxos. Located in the harbor of the island Portara is the first thing that every visitor sees once he arrives at the island. Portara is built on the island of Palaces, or the island of Bacchus as it is also called, located at the left of the port of Naxos. Portara is the huge marble gate of the temple which was built in the 6th century BC for the worship of the god Apollo. In the area of Υria, you will see the sanctuary of Dionysus, which historians considered to be forerunner of the Parthenon. 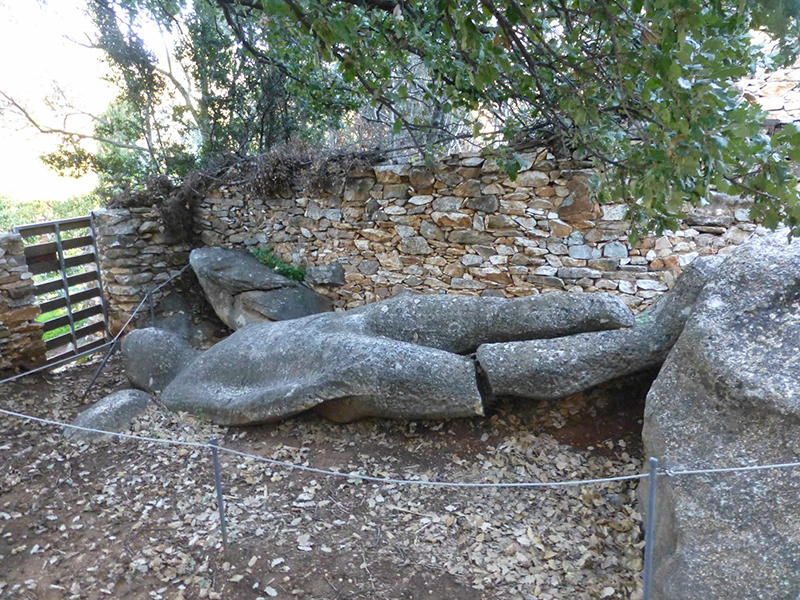 You can visit the archaeological site daily from 08:30 to 15:00 except from Mondays. The sanctuary of Dionysus is located at Υria, a few minutes away from the village of Agios Arsenios and about 10 km from the town. 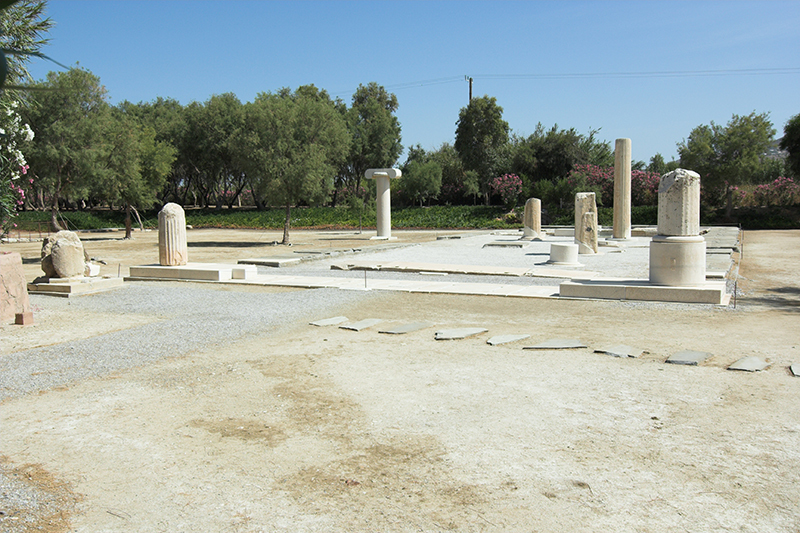 Kouros and Kore of Melanon are two of the most characteristic monuments-statues not only of Naxos but whole Greece. They are located in the area of Melanon. The two impressive statues are in Flerio region, after the village Myli and before the village Kinidaros, which is about 9 km from the town of Naxos. 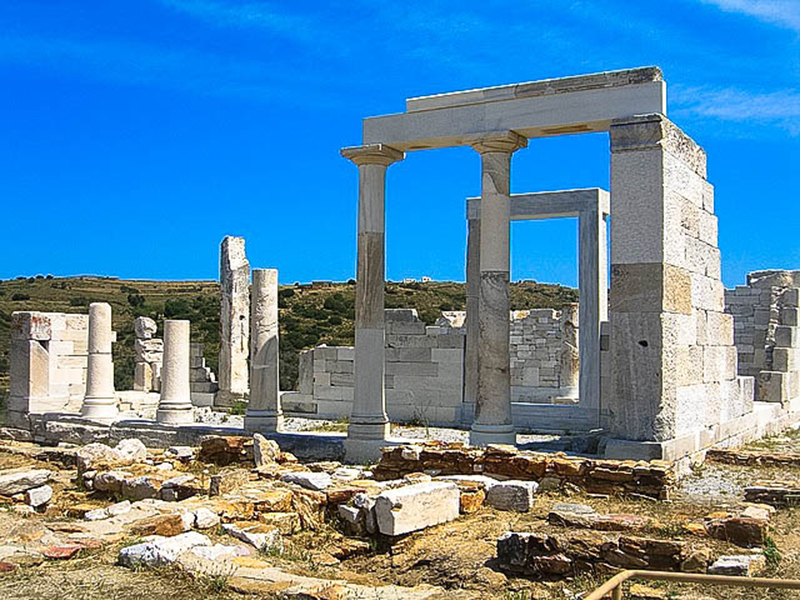 The Temple of Demeter or else, the Sanctuary of Gyroula is located in the village of Sangri, a few kilometers from Halki and 11 km from the town of Naxos. In Sangri, you will also see monasteries, castles and ancient monuments. The Temple of Demeter is made of white marble, has a square shape and the front and inside there were marble columns. 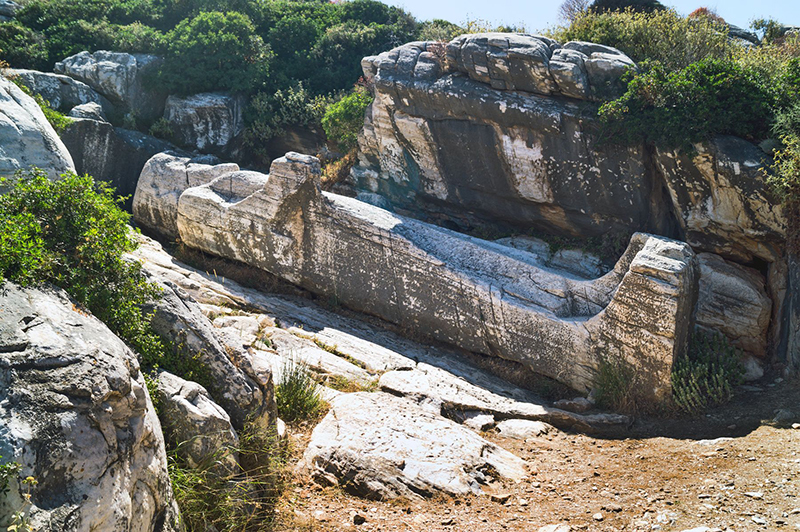 The”lying” Kouros of Apollo is one of the highlights that you should definitely see during Naxos holidays. Archaeologists estimate that Kouros of Apollo was created in the 6th Century BC and its length exceeds 10 m. It is “lying” at the entrance of the ancient quarry of Naxos and impresses visitors because of its huge size.